Today’s article has a two-fold purpose: it’s part of the series of reader’s embroidery stitched under the influence of Needle ‘n Thread, but better yet, it demonstrates a creative way of overcoming the Most Disappointing, Horrific Experience of Color Run from embroidery threads that are not color fast. Have you ever embroidered something with threads that you thought were colorfast, only to have them inexplicably bleed their dye onto the ground fabric come washing or rinsing time? It can be a gut-wrenching experience! You’ve put hours – possibly weeks or months – of work into a project and you come to the point where you want to wash it or rinse it. You do so, still confident and happy, glowing in the sunshine and satisfaction of your stitching accomplishment. …there it is. DYE. Oozing all over the ground fabric. Blurring the lines of your beautiful embroidery. Seeping out of the threads and spreading a halo of destruction around your stitchery. Oh, woe is you! And woe is me, too! It’s the hardest situation to advise people on, because there aren’t too many solutions that absolutely work, or that work in every situation, to clean up the mess. 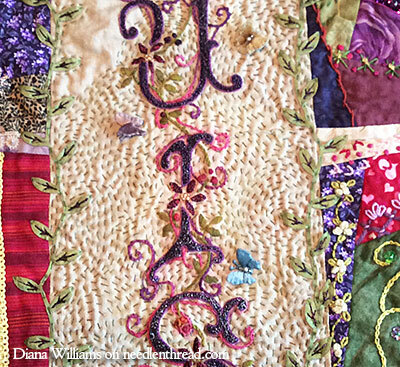 Using this monogram alphabet from Needle ‘n Thread, Diana embroidered her daughter’s name on the centerpiece for a crazy quilt that she has obviously put much time, care, and work into. It’s a lovely piece! 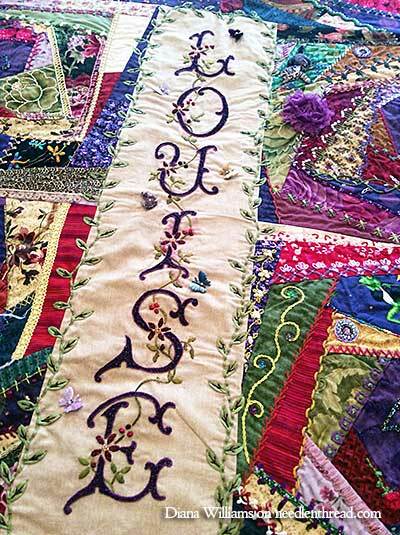 And adding the name to the center is a great way to use a decorative alphabet to personalize a crazy quilt. Using metallic threads from Kreinik, she outlined the letters and filled them with hundreds of French knots in the same thread. When the centerpiece was finished, she washed the quilt top, never expecting that the metallic threads would not be colorfast. Here, you can see the color run a little closer, in the areas where she had the most difficulty trying to remove the offending dye. A difficult situation, indeed! And what to advise? Continued rinsing did not solve the problem. With the surrounding crazy quilt made up of a festival of colors, and with so much embroidery work already done, using a compound that removes dye would not be the best idea. Why risk dulling those wonderful colors? Re-working the center name? Oh goodness! Only if desperate, right? You see, there are so many things to try, but nothing that’s absolutely guaranteed to work. So, what did Diana do? Did she find a magic solution to remove the dye and salvage the piece? Did she start over and re-work the letter panel? Or did she do Something Else? Well, she did Something Else. 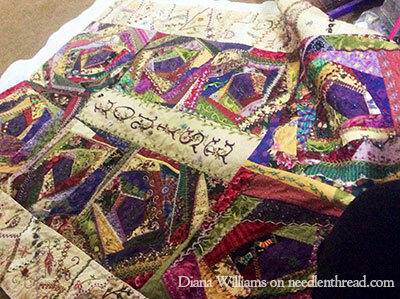 She took the quilt to Quilter’s Fancy in Cortland, Ohio, and consulted with Cindy. Cindy suggested enhancing the letters with another vine – instead of trying to make the dye go away, work with it! So Diana picked out some pink and purple Cosmo threads and embroidered in some whimsical vines around the lettering, working over the areas where the dye had run into the fabric. Here, you can see a little closer the fanciful vines worked around the letters, in brighter pinks and purples that mask the dyed area. It looks fantastic! It looks fun! And it was an ingenious idea. She also worked marvelous swirls of running stitches all over the background behind the letters, adding texture and movement to the panel, and further distracting the eye from ever noticing that there was any problem at all. You can’t see the dye run at all. A beautiful save on a beautiful piece of embroidery! Whew. I love happy endings. Have you ever had a dye disaster? Any advice on how to salvage the piece or remove the resulting glow? You never know who you’ll help by sharing your experience below! For those just joining in, this is a continuation of series of articles that highlights embroidery from the Needle ‘n Thread community, especially needlework influenced by information, tutorials, patterns, and so forth from Needle ‘n Thread. You can find a call for contributions and an explanation of the series here, and you can see previous examples of embroidery-related reader contributions here. Brilliant save! In addition to inspiration, you provide such a service to your readers! Thank you, thank you! YAY Mary!! Thanks for posting about Diana’s problem & how she solved it. And ESPECIALLY for sharing about one of my favoriate resources for help, inspiration & treasures–Cindy Zlotnik Oravecz at Quilter’s Fancy in Cortland, OH. This is a Michelin 3 Star (Worth A Journey!) kind of place for embellishments, fabric, books & classes. Both Cindy & her assistant Renee are very generous with advice & product how-tos. She also has an online shop & does quilt shows. Yes–I’m gushing! Usual disclaimers, very satisfied customer etc. What an AMAZING quilt. I’ve had no dye disasters, (and I hope I never do) but I don’t think I’d survive the trauma! I have not had embroidery threads bleed but I have had fabric bleed. I was all my quilts in a product called “Synthrapol”. It states on the bottle “removes excess dye from hand dyed fabrics”. It, essentially, captures the loose dye molecules. I also use “Shout Color Catcher”. Between the two(and sometimes it takes more than one try) I have not had too many problems with bleeding. PLEASE–keep in mind–do NOT put your work in the dryer–it heat sets the color bleed! Hope this is of value to you. PS: both of these products have helped after the fact(you know–after it has already bled). Good luck. Sorry about the typos. I hate the auto correct. Should have proof read the post before submitting it. The second sentence should read “I WASH all”. Also, I have found that sometimes starch will cause bleeding of colors. I don’t know why but have had it happen. I have also had luck with Shout Color Catcher. It did dull the colors somewhat but noone notices and the ground fabric is clean. Did take several tries. Arlene, you are so correct. I teach Family &Consumer Science, formerly known as “Home Ec” , and my Fiber Arts students frequently need to use Synthrapol. We really like the results. As long as a bleed of dye has not been heat set in the dryer or by using an iron you can wash and re-wash something and eventually the rogue dye should come out. In 34 years of teaching you cannot believe some of the stuff I get asked to remove from clothes or fabric! My biggest challenge was a volleyball uniform that had been washed and dried with a pair of jeans that had a set of red waxed lips left in the pocket…..ugly, real ugly. I used some pretty powerful petroleum distillates and after about 5 hours of scrubbing it all came out. Next time, I’m sending the bottle of stuff home with the student and will “let” them take care of the problem! Sometimes I’m a slow learner. Wonderful quilt. Would you suggest dry cleaning the piece instead of washing? I probably would, because it looks like there’s a whole mix of different fibers involved, plus some dimensional work. I think dry cleaning would probably cover all bases. But, admittedly, I’ve never made a crazy quilt, so I’m not sure what the preferred method of cleaning would be among the CQ community. I’m sure there are plenty of folks who could chime in on that, though! Whew what a relief, I was intrigued with this all that work and all those French Knots and the work that went into the quilt Diana must have been devasated when she realised what had happened. But what a brilliant idea of Cindy’s to work with the dye and enhance the embroidery with vines and running stitches with the same coloured thread. A great story and thankfully with a happy ending. Thanks Mary for sharing this technique of what you could do with colour run. I have had good results removing excess color bleeding in fabrics using Synthrapol, a product made by ProChem Chemical and Dye in Somerset, Massachusetts. This is a liquid added into wash water. It has worked well for me with fabrics and I expect would be just as good for threads that have bled. I have had good luck ( most of the time) with a color that has run. I soak the piece in ice water for days and days. I change the water often and add ice as it melts. When it looks like it is gone I try to get it as dry as I can with a towel and either dry it flat or dry it with a hair dryer. This probably wouldn’t work that well with a quilt but for smaller stitched pieces it is worth a try. I’ve had success preventing threads from bleeding on stitched embroidery using the ice water method. I didn’t realize it would also work if the bleeding had already occurred. Thanks. stitching and the colour does not change, but after 2-3 boils the water stays clear…so hopefully, no more “running” later. Thank you so much for this tip!! I tried the ice water and storing it in the fridge for a small piece I did. It worked!! I’m so happy that it went away. Ill definitely be keeping this tip handy!! 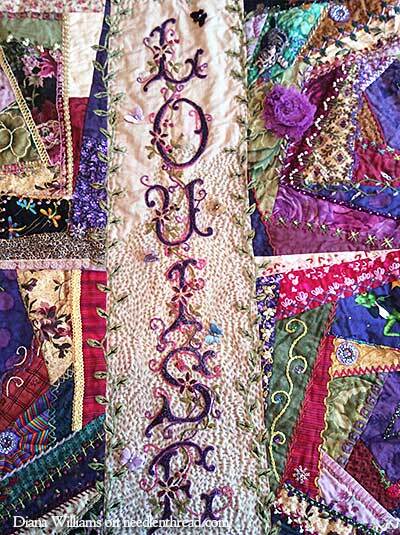 I am a quilter and love your newsletter for embellishment inspiration. When I read this issue, I wanted to share that there is a product to try called Restoration Soap by Engleside Products that has worked on many a quilt and antique table linens to remove dye runs and stains. Follow instructions on the jar. It has not damaged any fabric or table linen and has worked every time for me and many of my friends. It is available on their website and many others that sell threads, etc. I am not associated with them, just a happy user. I learned about it from another quilter, Cindy Needham, at a lecture she gave while at the Houston Quilt Festival a few years ago. I do not have a solution but sure wish I did, I have a Brazilian Emb. piece that the colors ran when I soaked it to get it clean after stitching. The strange part is it was not the reds that ran but peach and it could have been much worse. Where I have it hanging it is not real noticeable as it is not in light and is behind glass with not much light shining on it. I’ve never had a problem with bleeding threads, but I have only ever used DMC regular 6-stranded cotton floss. But I also never thought of testing threads before using them. I can imagine the devastation of realising that your threads were not colourfast and bled. But anyway, that quilt is very impressive, Diana. Looks like it took you quite a long while. And that was a wonderful solution to the problem. Your story is a perfect example of just finding a way to work with whatever happens. A friend taught me to boil in water with vinegar the embroidered piece, so the embroidery thread (usually red) will not tarnish. I haven’t tested yet, but I believe it works! Many years ago, I had something similar happen. A clerk suggested using a non-chlorine bleach with water as hot as was possible and soaking it. I used Snowy bleach and that did work. More recently I have come to swear by Oxiclean. You don’t want to use it on rust (which is a form of oxidation, so oxygen bleaches will make it worse) and it doesn’t help much with grease, but anything else is fair game. You may need to use it in a higher concentration than the directions suggest and to soak it longer, but there are very few other things which I have been unable to get out, and right now I can’t even think what they were. I also recently bought something called “Restoration” from Nordic Needle which is supposed to be good especially for old and yellowing fabrics. I realize this is something different than the problem you mentioned, and I have not tried it yet, but I thought I would put it out there as another possible solution. I know Roz at Nordic Needle thinks of it as a wonder worker. I have had luck – sometimes – with regular household/first aid grade hydrogen peroxide (3% stabilized hydrogen peroxide). Any time there is a stain you just have to experiment. Use a cotton swab and dab a bit of the peroxide onto the area where the color bled – wait a bit – while waiting you could put it in the sun. make a note of the change, if any. It may work on one color bleed but not the other. I have been able to curate several old fabrics this way but it does not always work. If it lessens the stain, continue to apply it a swab at a time. I do NOT dunk the fiber in peroxide and I do NOT pour the peroxide on the piece. I embroidered a small sampler which was a copy of a French red alphabet sampler, using DMC red/burgundy varigated floss. When I pressed it with a little steam, even through the muslin that I had to protect it, the red ran somewhat into the linen fabric. Fortunately, since it was a copy of a nineteenth century sampler it just made it look more authentic – but I will be washing my red threads in future!!!!! When life gave Diana grapes……… 🙂 Lovely for Louise. Oh, what a save! And such beautiful work, too. My solution may not work for dye, but it would be worth a try. I had my sheets on the line, and a very large bird full on mulberries left it’s very large mark. I soaked the offending area in white vinegar, and nearly all of the mulberry stain came out. I am tempted to find a piece that has bled and give it a try. As a quilter, that has used in her emroidery using hand dyed floss, if I need to wash the piece I use synthrapol. Synthrapol is a product used for prepping and rinsing all the loose dye out when dyeing fabric. In fact I wash all my yardage goods with synthrapol before piecing a quilt, blues and reds seem to bleed. A machine quilter friend of mine spritz a quilt top to get the quilting marks to disappear and her red work bled – washed with synthrapol and it worked! My go to has been Oxyclean- leaves the colors bright and the whites white. I’ve only used it on cottons. I have used Hydrogen Peroxide 3% solution sprayed directly onto the threads and then sponge-swabbed ever so gently. Let sit for a few minutes and then rinse with cold water immediately and re-wash. It’s been a life saver on several occasions! I had a nametag that I stitched on white aida with green dmc. I finished it with dark green moire fabric. I got some food on it and rushed home to rinse it off. The thread did not run, but the fabric did! I had no success in removing the splotches, so I put the nametag and some left over moire fabric in warm water and left them to soak overnight. Now I have a nametag stitched with green dmc and a lovely green aida background. No one remembers that it used to be white aida and I can still use it! Inspired save for the crazy quilt. I’ve seen Quilter’s Fancy at quilt shows and they do have lovely things. True crazy quilts do present real problems for cleaning with all the variety of fabrics and threads, many of the fabrics being fragile silks or synthetics. I had a piece I did where I died the fabric (a beautiful, deep Lenten purple) and then stitched it in white. The purple bled all over the white! I was distraught, but a weeklong soak in a bucket of Polysorbate 20, a bit of OxyClean and some Dove dishwashing soap, did the trick. And yes, I did change the water a couple times during that week. The Polysorbate is a surfactant – that is, it makes water wetter. That’s what pulled the trick. I keep a bottle around just in case. One disaster, using weeks hand dyed floss for cross stitch. I carefully followed their directions for washing the piece, with no problems. It was when I was ironing the piece, prior to framing it, that the red bled and turned the background fabric pink. A quilting friend told me to wash it again, using synthrapol. Follow the directions exactly, which is scary, since you will be using hot water. Since I thought the piece was ruined, I didn’t have anything to lose, and I tried it. It worked like magic and lifted every bit of the pink out of the fabric. Piece is now hanging in my hall way! I have had success using washing up liquid, on a stump work embroidery, that red had run into white linen. It took several goes, but I am very pleased with the results. Hi Mary – Can you ask Diana to contact us at Kreinik to let us know which thread she used? The only thread color we have heard mentioned from a few other stitchers is 003L Robot Red, and we have taken that off the market. We’d like to know which thread she was using. She can email me at dlenham at kreinik dot com. Thank you! I had a similar problem with a cross stitch project some years ago. A very experienced embroiderer suggested running boiling water through the work until the colour disappeared. It worked beautifully and with no unexpected side effects! I strongly second the suggestion to use Color Catchers by Shout when washing or rinsing any embroidery piece. I’ve used them in my laundry for years and also use one when washing my beautiful silk scarves. The Color Catcher sheet somehow attracts and holds fugitive dyes that would otherwise bleed and ruin your fabric. Add a sheet to your water when washing or rinsing. It always amazes me when I see the newly colored Color Catcher sheet at the end of the process. Hi. I had some red silk thread run on linen. I was advised to hold it under a running hot water tap until the colour ran out. It helped. I could still see where it had run but I doubt that anyone else would notice. I breathed a big sigh of relief! The Country Women’s Association recommended putting yoghurt on the colour run and it absorbs the colour run. I haven’t tried it myself, but apparently it works. I finished an embroidered cushion in red just days before I was to hand it in for an exhibition. I gave it a quick wash and the red thread ran. I rubbed natural yoghurt over it a couple of times (rinsing in between) and most of the red came out. I don’t have a problem recommending it. I have always used boiling water in a stainless steel pan and rinsing the item several times in hot water. You remove the dye by dilution. Of course, the fabric has to withstand the heat. This might sound nuts, and I’ve never tried it in embroidery but maybe shaving cream would work. Before you scoff in disbelief let me explain… When I was 10 we had an oriental carpet in the living room and due to a shocking mischance one day my sister and I spilled an entire two liter bottle of Orange Slice soda on it. In order to avoid the wrath of a soon-to-be irate father, I immediately went to the fountain of all wisdom, my grandmother and she suggested shaving cream! Surprise, surprise it took out every last bit of the dye from the soda, leaving the rug pristine! I’ve since used it on ink stains as well, so maybe just possibly it could work for color run on an embroidery project, as long as it hasn’t set. Hi all. I recently completed an applique quilt made entirely from hand dyed fabrics that took me 2 years to make. It is very large, but because it has a lot of 3D applique, it was never meant to be anything but a wall hanging. So I did not wash the fabrics first. After I had completed it, I put it over a lounge chair overnight instead of putting it away. How stupid was I!!!! That night, it poured with rain, and my cat decided that the very best place to sleep with her muddy paws, was on the top of my newly completed, unwashed, hand-dyed quilt!!!!!! Next morning when I saw the quilt (by the way, the background was white) I had black pussycat paw prints all over it!!!!! I had a box of Colour Catchers that someone had given me, so I read the instructions carefully and put 2 Catchers into the washing macine, set the water temperature to 30c put in the quilt and prayed hard. Half an hour later, I took out the quilt and miracle of miracles, only 1 very small color run. So I decided to wash it again the same way and this time NOT A SINGLE COLOR RUN ANYWHERE!!!! Obviously, I would reccomend Color Catchers, but make sure you have the water temperature at 30c at least. They do not work if the water is cold. i have had wool felt bleed, didn’t know how to fix it so I wet pieces of different coloured wool felt and squeezed blobs onto the linen, it looked fine, multi coloured. I was assessed at university and won the sculpture prize for excellence. Further, if I spill anything onto my embroidery or get a mark on it whilst working, i remove it with a paste of nappisan (nappy soaker) and leave it over night. That works. I do Brazilian Embroidery and those threads are notoriously not color fast, especially the reds. So when I wash a finished piece I use a Shout brand ‘Color Catcher’. I usually put one under and another on top of the piece as I am washing, rinsing, and drying it. If I see color run, I wash the piece again and use anothe set of color washes. For one quilt patch piece I had done I ended up putting a Color Catcehr under the piece and on top of the piece, then weighted it down and let it soak over night. All of the bleed came out. Years ago when I was doing a cross stitch pattern with newly purchased variegated thread…no one told me not to wash it before framing…lo and behold the browns, rusts and oranges all left dye stains on the fabric. After various attempts to get them out…I opted to soak the entire piece in water that I had added 4 tea bags to. In other words…I chose to alter the look of the fabric to cover the dye stains. Since this was a fall scene with acorns and fall leaves it gave the whole piece a new look and just made the stains blend into the fabric….but was distributed throughout the entire piece…I still get many compliments on the look of the fabric and no one is wiser….but me….lesson learned! I have to put in my vote for Color Catchers by Shout as well. My MIL had spent months working on a set of embroidered blocks for a quilt. When she washed them to wash away the printed pattern, the reds ran. She was devastated! A vendor at a quilt show recommended the color catchers. She is not usually one to try “new and improved” products (still uses fels naptha soap on a regular basis). She washed each block by hand individually in a basin with a color catcher sheet. It took the whole box doing it this way, but almost all of the pink came out. I have had this happen to me with embroidery & quilting. Never again. I pre-wash everything with a cotton base. Full stop. With embroidery threads I take a 6 inch piece & put it in cold water with a little mild washing powder. It runs, It’s Out. Horrible problem; brilliant save. I would have advised along similar lines, as in, if you can’t beat ’em, join ’em. I may have gone for painting more of the colour around to make it look as though it had always been there but that is not something that frequently occurs to crazy quilters. 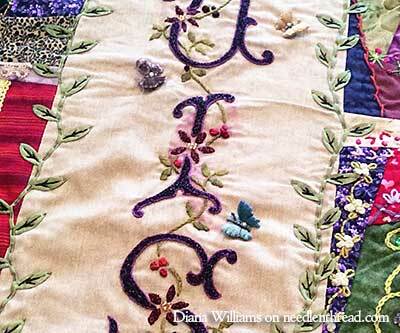 The next would be to stitch over it which is just what Diana has done, and done beautifully. It looks fabulous. I have had colours run on embroideries and have used DYLON S.O.S. COLOUR RUN which worked beautifully. What I want to know is how it knew which bits of colour to remove? I expected the whole thing to come out white! I think the answer is that this type of product attracts “fugitive” aka unattached dyes. To the extent a dye is properly fixed, no problem. To the extent is dye is not properly fixed, or floating around, these color catchers attract and bond to them. It’s a miracle! The quilters friend is a product called Shout Color Catcher by Johnson and Johnson. It is a fabric sheet that looks like a dryer sheet but you put it in during the wash cycle. It literally catches and removes dyes from the water. I have even have it work on a red and white quilt whose colors ran in a first wash and was rescued in a second wash with the color catchers. It is available in the laundry aisle at the market. My experience was not with threads but a cord. I embroidered a cushion front on pale blue evenweave, and bought some dark blue cord to edge the cushion. The time came when it was to be exhibited, and I decided to wash it, very carefully. I rolled it in a towel, to take out a lot of the moisture, then laid it flat, and even shaded it from direct sunlight while it dried. Next day I was amazed to find the dark blue colour had run. I have another cushion edged with the same cord, so obviously the cushion cover must be deconstructed before attempting to wash it. Absolutely brilliant! Thank you for sharing! Camouflaging the run was a great idea. The more I look at it, I think I like the block with the background stitching added even better. I’m going to print out this post and file it both with my needlework/sewing information, and in the laundry room. I should be able to find it one place or the other. I hope. I think it looks even better with the enhancements than without! I had a similar situation. It was a silk and metal design on silk ground. Design called for blocking, using distilled water to moisten. After several hours for drying, the med dark red bled. I used a product called “Shout Color Grabber” I remoisted the area where bleeding occured and blotted with the grabber, it soaked up the color. Took a lot of dabbing, but the result is quite acceptable. I have used this product previously when washing a shirt I had embroidered and the colors ran. Rewashed using the grabber in the water. Eureka it worked. Hope this helps. Before the turn of the century when Piecework magazine was young, there was an article on restoring old textiles by a woman who did it as a specialty service. One day I found a ‘possum mommy and her babies in my stash hidden (?) in a dresser in the garage. Mommy had her babies in the drawer with the tablecloths…ugh. After they were removed, I used the method recommended in that article. In Hot water, dissolve Clorox 2 and Ivory liquid. No recipe recommendations so I just was wingin’ it. Soak for a long while. Rinse. Soak. Rinse…..til done. I put everything in the bathtub and really didn’t rinse, just drained water and refilled. It took about 2 days, but whites were white and colors bright. Maybe this was before the other products were available, but it worked. I am SO glad so see this post. I had a quilt in an art show. It has lots of embroidery on it. Anyway, after it was returned I notice a stain and I can only presume it was from someone at the opening spilling wine or some other beverage onto it. SO, I was looking for answers, too. I hope the comments provide me with a few solutions. I tried once and it only made it worse. I would love to get it fixed. Unfortunately adding more doesn’t seen like a viable option for me. Would using Color Catcher by Shout have prevented the color run? However, I love the end results better. One of the things I learned many years ago are two products that I use all the time, on fabrics as well as threads, Synthrapol and Retayne. Synthrapol is a highly concentrated surfactant and I use on all fabrics that I purchase and get home with. Before those fabrics go beyond the washing machine. It takes a very little amount (like teaspoons) to set the dye and is especially good for home dyed fabrics. Retayne is a color fixative and does stop the bleed. These two items are in my wash room all of the time. I even use them on threads that are dark like reds, purples, dark like blues, etc. Cindy is the best. She has a wonderful shop and full of knowledge. Coming at this late in the day (I was on holiday at an embroidery class, down at Wemyss)I am trying to remember when I wrote about my “accident” with coloured silks and a long term embroidery. Basically, watch who you send it to for treatment. I sent mine back to the thread makers as they claimed their silks were colour fast. I had four years of silk shading in the picture. One gentle cool water wash with the merest hint of detergent. That’s all it took -AND the making of a batch of red dyed silk that was not correctly washed out before selling. They treated the silk with a gentle dab with diluted H2O2. Well it sort of worked but I am non too happy with the treatment. Silk rots with acid application. I had this exact problem with my quilt, I washed the quilt in my washing machine with 2 dye catchers, problem solved, no red dye anywhere. I had a similar problem after working on a hand done Baltimore Quilt for 7 years I washed it,and the green and blue dye run not the red.I was stunned.A friend from the USA told me to fill the bath with as hottest water I could with a cupful of dawn/fairy dish washing liquid and leave it soak for 6-7 hours.if needed do it again. After 24 hours the quilt was dye run free. This is the method that the museum in Nebraska USA uses to get dye out of very old quilts. I have since washed by stash in this way. I was lucky no one wanted to use the bath. I have washed embroidery successfully many times, by soaking them in Oxyclean and then rinsing. But, this week I washed my niec’s sampler, made in 1987. She was only 9 and so, it is precious. Help! The purple letters have run. I have rinsed it and dried it on a towel, but is there anything I can do to remove the colour run? Clearly, I don’t want to rest itch what she did as a child. Thanks.